The Talent Profile analyzes 79 character traits and 34 vocations. This report takes numerology to a new level, now with visual cues to easily view your strengths and talents. Using horizontal graphs, your Talent Profile compares the ratio of a range of personal attributes in your numerology chart. Matching your personality and inherent talents with the vocations they are most suited to can help you identify areas where you are likely to succeed and find contentment, and inspire you to build on those strengths. Life-time Lucky Numbers are in play for the duration of your life, while others come and go based on your personal cycles. 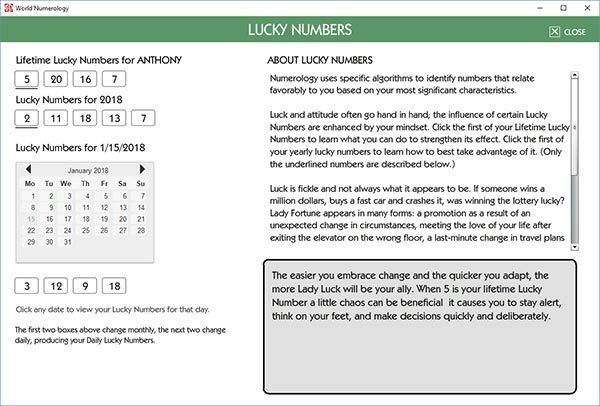 Our Lucky Number program uses specific algorithms to identify numbers that relate favorably to you based on your most significant characteristics. The calendar lets you select your Daily Numbers for any day - pay particular attention to the last two numbers (sometimes three) below the calendar as you switch days, as those tend to be the most powerful for that period. The World Numerology App delivers this deeply revealing numerology analysis twelve times per year - recommended once a month. The Inner Reflection reading taps into your subconscious by asking you to select nine single-digit numbers using a perceptive number generator. The result will amaze you, as it reveals what you are going through now on a deep psychological and emotional level. Think of it as a snapshot of your current state of mind, with an x-ray focused on what is hidden under the surface.